Before reading this chapter, ask yourself or discuss with friends: How do I pray when I am in the presence of the Blessed Sacrament? In what other ways do I pray? From very early times some hosts were kept aside after Mass to be given to the sick. According to Justin Martyr (about 155 AD) deacons took communion to the sick, and people were even allowed to take hosts home and give themselves communion during the week. In those days the hosts were kept in a cupboard in the sacristy. There was no custom of having a light to indicate the presence of the sacrament. Later, the reserved sacrament was moved into the church, sometimes in a container suspended from the ceiling. 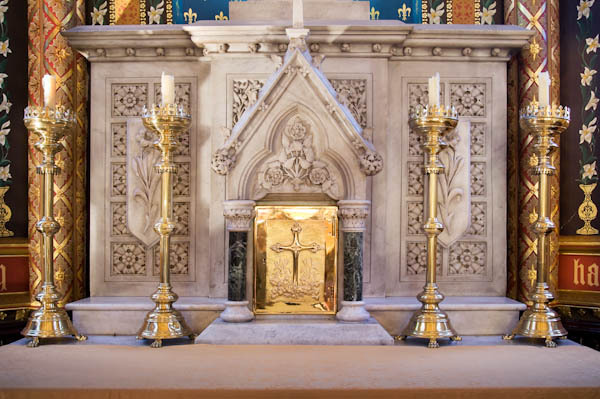 Eventually the sacrament was moved to the altar in what came to be called a ‘tabernacle’. Then a devotion to the presence of Christ in the reserved sacrament developed and grew into a significant spirituality in the Middle Ages, as discussed in Chapter 1. This fact gives us a historical perspective on prayer before the sacrament to add to the history I wrote about in the first chapter. The celebration of Mass is a dynamic action that moves along while exposition is a time of stillness. The rhythm of movement and stillness is part of the music of the Eucharistic mystery. The link between the celebration and the exposition of the sacrament is well brought out in the Rule of Life of the Blessed Sacrament Fathers and Brothers. The word ‘dynamism’ is important; the celebration of the Eucharist is a powerful action packed with energy, but needs to be complemented by a time of stillness – like using the pause button on a DVD to hold one frame for special attention. Exposition halts the ceremony to give you time to contemplate what happens at Mass, time to wonder at the extraordinary gift of the Eucharist, time to thank Jesus for being willing to suffer and die for us, and time to thank God for raising Jesus into a new life and giving us a share in that new life. By drawing our attention to the signs of the sacrament, exposition of the Holy Eucharist calls to mind the celebration of the Memorial of the Lord. 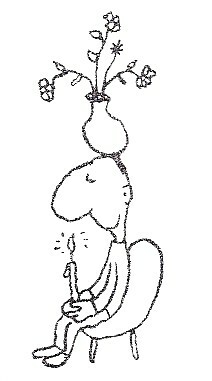 The Church encourages prayer before the sacrament. 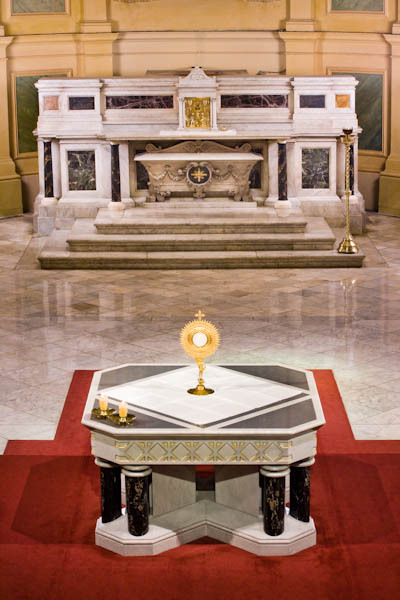 Older people who grew up having to genuflect on both knees when the Blessed Sacrament is exposed, and who are now finding it difficult to get down on both knees and even more difficult to get up again, may be relieved to know it is not necessary. This is one way of praying when you are in the presence of the blessed sacrament. 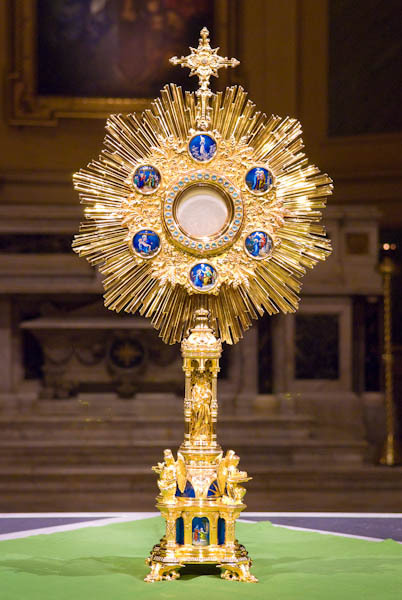 Gaze at the bread in the monstrance with the realisation that the risen Christ is with you. Use a mantra such as ‘Jesus Christ, the bread of life’, and repeat this in your heart to keep your mind centred. Time the words to your breathing; this helps to focus your thoughts. Do this for as long as seems appropriate to you. Then in your imagination think of the presence of Christ flowing like a stream of living water from the bread into your heart, so that Christ is not just ‘out there’ but is within you. Then your focus is on the Lord in your heart. Keep repeating the mantra. There is no need for thinking or rationalising; there is no need to talk. There is a need to listen for any message the Lord may place in your heart or your mind. The simple awareness of the presence of Christ in your heart is good prayer. Continue this for as long as you feel is right for you. Many parishes now have times of exposition of the sacrament. This is very laudable but, unfortunately, the link with the Mass is not always evident even though the instruction about this was made more than 30 years ago. A very good way of expressing the relationship of exposition to the Mass is to make exposition on the altar where the Eucharist is celebrated. Exposition is not a stand alone event separated from the dynamic movement of the celebration. It is disconnected from the Mass when exposition is made on a throne away from the altar or if it takes place in a separate chapel. This gives the impression that exposition is an end in itself, as it was for some centuries before the present reforms. Some parishes try strenuously to have exposition twenty-four hours a day, seven days a week. This is praiseworthy, but also has the danger of becoming another end in itself and can assume more importance than the basic aim of getting parishioners to use a prayer of contemplation in the presence of the sacrament. Parishioners need to be taught how to pray in the presence of the sacrament. To spend the time in reading, albeit a religious book, is not making the best use of this precious time. There is the story of an old African-American woman who was asked what she does during the many hours she spends in church. She replied, “Sometimes ah sits and thinks, and sometimes ah just sits.” To just sit and be aware of the presence of the risen Christ is good prayer. You do not have to read prayers from a book, you do not have to talk constantly to Jesus, you do not have to think. As you progress in the art of prayer, just to sit and be conscious of the presence of Christ is sufficient. Many do not have the opportunity to go to a church where the sacrament is reserved and often parish churches are locked because of the danger of vandalism. In that case, you need to find some quiet time at home or in a park. Jesus sought solitude for his prayer. Wherever you are, you can think of a tabernacle where Christ is sacramentally present and you can still imagine the presence of the risen Christ flowing to you like a river of living water into your heart. The distance between you and the tabernacle is not a problem for the risen Christ. Alternatively, you can think back to the last time you received communion and be aware the spirit of Christ is still with you. I use this method myself and find it is a very beautiful form of prayer. Simply set up a Bible opened at your favourite text, the reading of the day or just at random. Set a lighted candle next to it, use incense sticks if you wish, and follow the method I indicated above with the consciousness that Christ is feeding you when the words of Scripture are read. You ask the Holy Spirit to guide you, to pray within you, to empower you from the boundless energy supplies of the divinity. Then you become conscious of the presence of God as Son and as the Word. This takes on a more powerful dimension with the opened Bible before you. Jesus’ teachings are there, God’s Word is there. But not just ‘out there’ on the printed page; Jesus the Word is in your heart. Remember that Jesus is the way to the Father; ask him to lead you to the Father. Then be aware of the presence of Father, Son and Holy Spirit in the depths of your heart and that the love between these divine persons is the love that God has for you. Saint Augustine has the same message. You could spend a long time contemplating such awesome love. A healthy spirituality must include some time for contemplation, for reflecting on the big questions of life: Why am I in this world? What is my relationship to God, to members of my family, friends, others? What are my priorities? Is there life beyond death? The ultimate question, especially for those with a scientific mind is: Why is there something rather than nothing? The pace of life today is so frenetic we must program some quiet time into our lives as a priority. Modern life is so noisy with radio, TV, background music in every supermarket, iPods, mobile phones. It is essential for anyone who wants a spiritual life to make sure there is some time for the three S’s: Silence, Stillness, Solitude. Those with families have a special difficulty as many in the family have their own musical devices making homes noisy places at times. Some find the only time to get some silence is to get up early while the house is still quiet. The Australian Broadcasting Corporation presented a TV reality series in 2007 called ‘The Abbey’ featuring five women who volunteered to spend 33 days in a Benedictine convent sharing the life of the 30 nuns there. What was stressed very strongly to them when they first arrived was the value of silence. They found it very difficult to keep silent – it was something completely foreign to them. Yet a certain amount of silence brings wonderful benefits to the spirit. If you find the word ‘mystic’ a bit off-putting (me a mystic! ), settle for being a ‘person of prayer’. Jesus gave us the Lord’s prayer but did not leave us any techniques of meditation, such as there are in Eastern religions where various techniques of breathing, posture, eyes closed or eyes open, mantras and so on are taught. However, many of the Christian saints and mystics have come up with methods very similar to those of the East. In the last 50 or so years there has been a lot of interest in these methods and there has been a rich exchange of these techniques which has been very beneficial to those interested in deeper forms of prayer. These methods are a big help in avoiding distractions which are the great bugbear of meditation. However, it must be kept in mind that being distracted is normal for us humans. The best we can hope for is to keep distractions to a minimum. You must not feel guilty about being distracted, but simply turn your mind again to your prayer in tranquillity of spirit when you realise your mind has wandered. All cultures have a tradition of meditation, of quiet listening to the spirit in the depths of our being. Australian Aborigines have their tradition of dadirri. I find it somewhat disturbing to see in public places so many people with ear plugs – disturbing because I wonder what they are listening to. I would be delighted to know that my suspicions are ill-founded and that what they are listening to is something wholesome. Do these people who seem compelled to be constantly listening to something ever experience the beauty of silence? Anyone who is a compulsive listener, who must have some sound in their ears, is in danger of being incapable of living a sound spiritual life. Time spent in prayer ‘charges the batteries’ for our efforts at evangelisation. Just as Jesus took time out for prayer, so we need quiet times of silence to gather our thoughts and to renew our motivation for spreading the kingdom of God on earth.